We want to be beating and benefiting from the next economic crash. Many people in the Western world are thinking, “We’ll never see a boom again.” This is an financial illusion that seems to fit all… but as you’ll see below is ever so wrong. Here is a photo of sunset on our orange grove. The sun may be going down but see below why our agricultural profits are up. The financial illusion that there is nothing but economic gloom ahead is affecting a lot of people. Those who are just starting life are concerned. An April 19, 2011 USA Today article entitled “Economy crushes youthful dreams” says: For young people who came of age in the recession, the American dream of life getting better for each new generation feels like a myth. This financial illusion is affecting those with families. A Marketingvox.com article entitled “Financial Strain on Family Life Tops Issues Most Crucial to Women” says: Women and their families experience tremendous financial pressure on issues ranging from housing, to credit card debt, to healthcare. As a result, family women are concerned about long-term financial security, according to a Meredith Corporation/NBC Universal survey, writes MarketingCharts. The “What do Women Want?” survey included 3,000 women and covered a range of topics important to them, including marriage and family, health and fitness, safety and financial matters. Six in 10 women are concerned about being able to pay their bills each month (60 percent). 72 percent of women are concerned about rising taxes. 4 in 10 (38 percent) women “feel overwhelmed by financial burdens” – even higher for Gen X (47 percent) and mothers of children under 18 (47 percent) and single mothers with children under 18 (52 percent). 4 in 10 (38 percent) women have incurred medical debt – even higher among mothers of children under 18 (49 percent), especially young mothers 18-34 (59 percent). This financial illusion is affecting those who have or are about to retire. Excerpts from a May 24, 2011 USA Today article by by Christine Dugas entitled “Baby Boomers fear outliving retirement savings” says: Baby Boomers face so much uncertainty that nearly half of them fear that their retirement will result in poverty, according to a new study by California-based investment advisers Financial Engines. Among Boomers, 45% are at risk of running short in retirement, according to the 2010 Retirement Readiness Ratings by the Employee Benefit Research Institute. And one in four older workers have exhausted all savings during the recession, according to a new survey by AARP Public Policy Institute. A growing number of older Americans are piling on debt and filing for bankruptcy. While working longer may be the best way to boost savings, health issues and job loss can interfere. This is a financial illusion affecting every sector, but economic history suggests that we’ll see much brighter times ahead. Do not get me wrong. The research I have done on global economics suggests that we do have to bear one more terrible crash in the current 15 year bear cycle. This crash should start… right about now. Yet then we’ll be at the end of a 15 year bear cycle that started in 1998. This next crash certainly cannot be ignored. My family background for example is that my grandfather’s brother was the last British solider killed in WWI on some useless exercise. My grandfather was so outraged that he left the UK and immigrated to the USA. Even if the economic war is almost over. Even if only one more negative financial bullet that’s going to be fired. Even if the bear cycle is almost through… we have to be sure that our finances and savings are not ruined by this last round. Yet what the majority view as disaster is simply change. Change is good for those who prepare and adapt. The current downturn gives everyone a second chance to “not waste the recession”. After the 2008 stock market crash the mantra of professional investors was “we cannot waste the recession”. The horrible collapse of equities worldwide was one of the worst and as such created incredible opportunity…. as evidenced by the recovery of 2009. Professional investors jumped into the market! Those who purchased shares then… when everything looked so bleak… made fortunes. Now we have a second chance because the global real estate crash came after equity markets dove and real estate prices fall more slowly than shares drop. Excerpts from a May 31, 2011 finance.yahoo.com article entitled “Home-price index falls to lowest point since 2002” say: An index of home prices in big metro areas has reached its lowest level since 2002, driven down by foreclosures, a glut of unsold homes and the reluctance or inability of many to buy. Prices fell from February to March in 18 of the metro areas tracked by the Standard & Poor’s/Case-Shiller 20-city index. And prices in a dozen markets have reached their lowest points since the housing bubble burst in late 2006. The nationwide index fell for the eighth straight month. Prices have now fallen further since the bubble burst than they did during the Great Depression. It took 19 years for the housing market to regain its losses after the Depression ended. Prices rose last summer, fueled by a temporary federal home-buying tax credit. But they’ve plunged since then. This month’s report marked a “double dip in home prices across much of the nation,” said David Blitzer, chairman of the Index Committee at Standard & Poor’s. After adjusting for inflation, the home-price index has sunk to a level not seen since 1999. Many economists think prices nationally will drop at least 5 percent more by year’s end. They aren’t likely to stop falling until the glut of foreclosures for sale is reduced, employers start hiring in greater force, banks ease lending rules and would-be buyers regain confidence that a home purchase is a wise investment. Another obstacle to a rebound in prices: A delay in processing foreclosures. Homes in foreclosure sell for, on average, 20 percent discounts. Once those homes are eventually foreclosed upon, they will trigger a further price drop in many markets. Those declines are “etched in stone,” said Patrick Newport, U.S. economist at IHS Global Insight. The Case-Shiller index measures sales of select homes in the 20 largest markets compared with January 2000. But the damage is now spreading to areas that had long escaped the worst of the crisis. They include Dallas, Denver, Minneapolis and Cleveland. Economists regard them as housing bellwethers — metro areas that are reliable indicators of where national prices are headed. In the seven years before its peak in July 2006, the home-price index surged 155 percent. Since then, it’s fallen 33 percent. The way to beat this crunch is to set your affairs so you do not lose during the next crunch and liquidity to take advantage of the low prices and high value the crunch will bring. There are numerous of reasonably safe pockets of opportunity. For example inflation during these difficult economic times has helped profits on agricultural property. The agricultural rise creates opportunity in many ways. Investing direct into agricultural land, timber and water, as I have done is one. 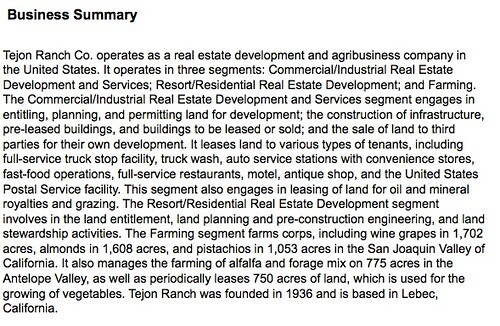 Take Tejon Land company as an example. 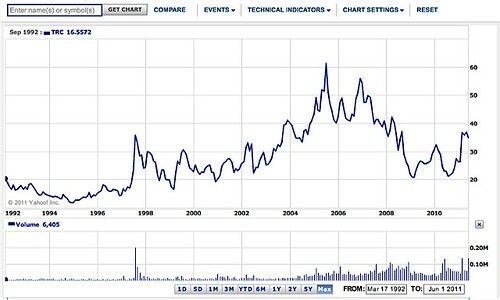 Here is Tejon’s share price chart from the same site. The 2008 US equity correction brought this share down to 2001 prices. The shares have recovered some but have been held back by the negative view on real estate. Falling share and real estate prices have pushed this down but the company has 270,000 acres of land… a great deal of it in agriculture that creates intrinsic and somewhat hidden value. Tejon Ranch was founded in 1843 as a Mexican land grant. The shares are traded on the New York Stock Exchange as NYSE: TRC. In the decades that followed, the ranch grew in size as additional land grants were purchased by Tejon’s founder, General Edward Fitzgerald Beale, a historic figure in early California. Today, Tejon is a diversified real estate development and agricultural company whose principal asset is its 270,000-acre land holding located approximately 60 miles north of Los Angeles and 25 miles south of Bakersfield. The company generates operating revenue from land entitlement and development, commercial leases, marketing of real estate projects, oil and mineral production, utility easements, recreational activities, and filming locations. Tejon also generates revenue from farming almonds, pistachios, walnuts, and wine grapes. This is just one of 11 agricultural and real estate equities we’ll view at our upcoming International & Investing Seminar. See more below. Keep in mind that the 15 year cycles we track are not exact… sometimes last only 14 and other times 17 years. The past is not synchronized with the future so the crash could come anytime. It may have started. It could come in a month (due to a US debt ceiling fiasco) or it could come in a couple of years. No one can exactly predict the future so diversification is important. You can see how diversified my portfolio is in the outline we shared at our February 2011 International Business & Investing seminar. We have increased our agricultural real estate holdings in the last year, but as you can see are well diversified in equities and bonds and currencies also. We look at my updated portfolio and see three diversified portfolios…. small… medium and large at our upcoming June 24 -26 seminar. There are numerous other ways to take advantage of profit pockets in real estate and agricultural now. These opportunities will only get better during an economic decline. They range from publishing to food sales to import/export to management to internet opportunities to service and marketing. Our challenge at this time is not to rearrange our lives for doom and gloom but to preserve our reserves so that we are ready to launch into the next… even brighter… future. More than ever before investing and doing business globally is vital for diversification and to adapt to this ever changing world so you can survive this upcoming economic crunch. See my portfolio update at our June 24 to 26, 2011 International Business & Investing Seminar in North Carolina. 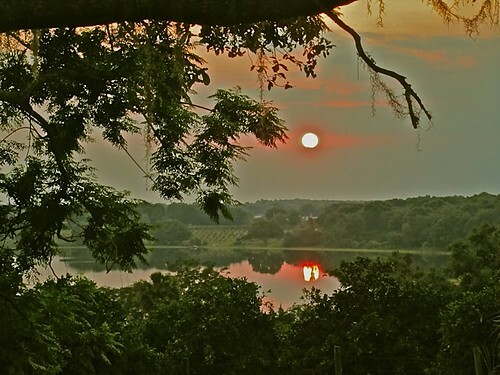 Learn about agricultural tours in Ecuador… learn about agricultural investments in North Carolina… learn about agricultural investments in Florida at our seminar this month.